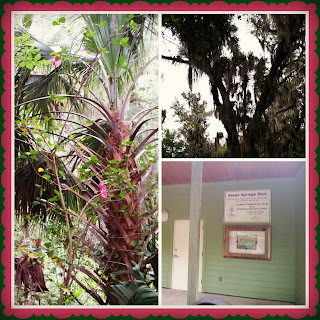 Today I want to tell you about another gorgeous park we visited earlier this month, in West Volusia County, FL. It's called Green Springs Park, and it is located in the city of Enterprise. The drive to this park is lovely, with many Live Oak trees dripping in Spanish Moss along the roads. I love this part of Florida - it is just so pretty! 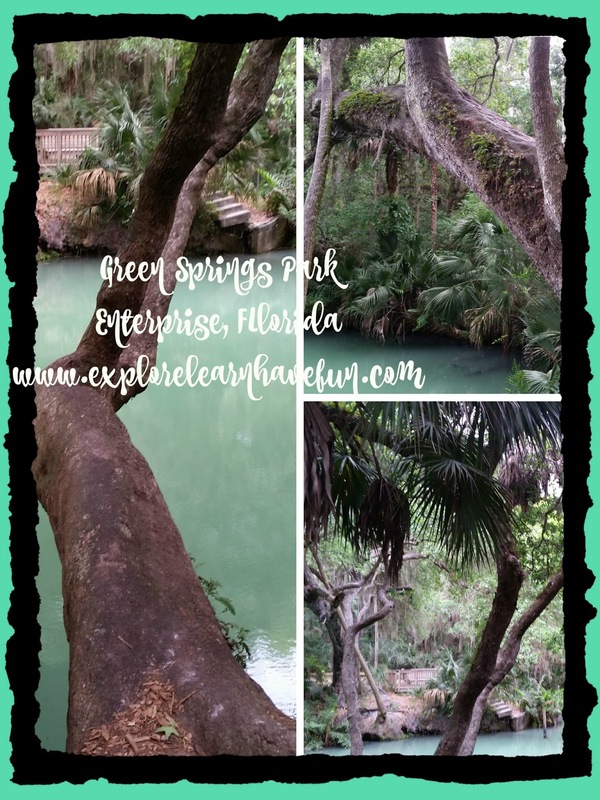 Starting from the parking lot, follow the paved trail to visit the Springs. It's not far at all, and you'll probably smell the sulfur before you actually see the incredible green water. It is....stunning. It looks like I photoshopped the color in the pictures - but I didn't! There are several areas where you can enjoy looking out over the springs - you aren't allowed to swim or fish here anymore, though. We eventually walked around to another area to look at the water and enjoyed sitting there for a few minutes on a bench. It's a very peaceful place, and absolutely gorgeous. So many beautiful plants, trees, shrubs and more. Birds singing, and you could even hear animals (or something!) quietly rustling in the brush near the paths. I could have stayed there enjoying the peace and quiet for hours! According to what I've read, this is one of only a few sulfur springs left in Florida. 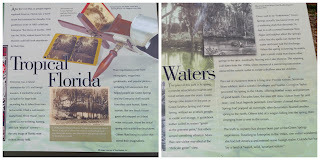 The water in the springs was considered restorative and healing by Native Americans in the area. In the 19th century, there was even a hotel built near the springs for "invalids" to come and soak in the springs for their health. Take a picnic with you, then sit under the pavilion for lunch after you explore the park! You and your family will really enjoy the peaceful beauty of this place. 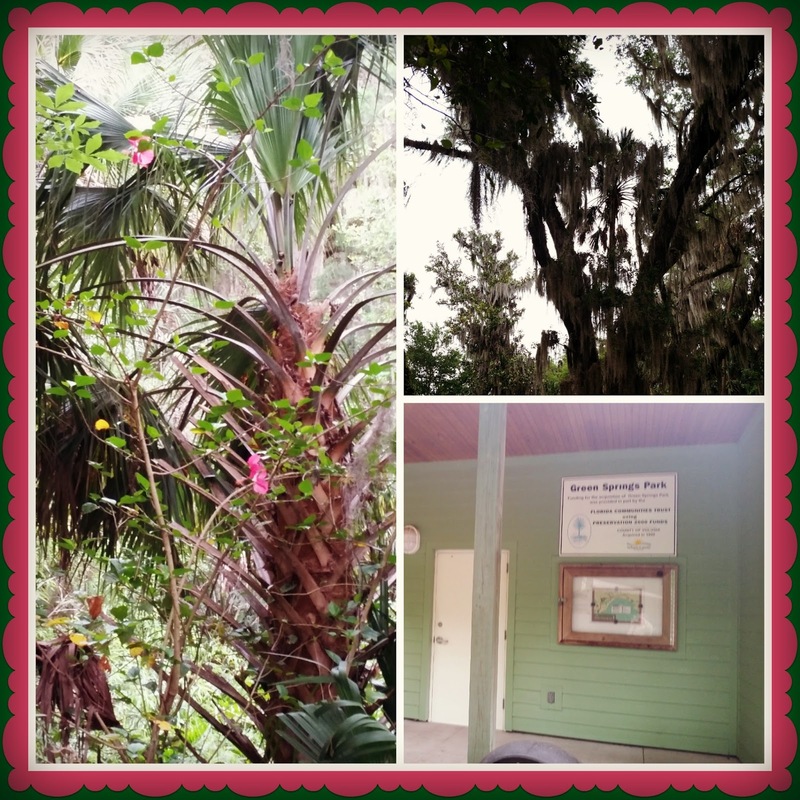 I honestly can't wait to go back to Green Springs Park next time we are in West Volusia county. Green Springs Park is located at 994 Enterprise/Osteen Road, Enterprise, FL. The park is open from sunrise to sunset and there is no fee for admission. Up next: DeLeon Springs State Park and the awesome restaurant where you cook your own pancakes at the table! Find out more about this and other parks and attractions in West Volusia county by visiting the West Volusia Tourism Bureau's website. We'll have to add this to a list for a Florida Road Trip! My guys love the outdoors and would enjoy this.